The H2 is based on the full-size heavy duty truck chassis. All H1s, H2s and Military Humvees have automatic transmissions, stick-shift option is available in the H3 and H3T model only. In 1999, General Motors acquired exclusive ownership of the Hummer brand name and the marketing rights from AM General, but AMG manufactured the H1 Hummers for the civilian market until 2006. The H2 is GM's own version of the original Humvee. While a Hummer is equipped to drive through water up to 30 inches deep (most components are sealed against the elements), it's not an amphibious vehicle, or a submarine, nor can it float. In fact, it is designed to take on water in order to avoid floating, all the while maintaining traction underneath. The Hummer is designed in such a way that when fording through deep water, a significant amount of water will actually enter the vehicle, only to be released afterwards through the drain plugs in the floors. While military Humvees have a snorkel kit extending the exhaust and air intake to roof level, making it possible to operate in 60 inches of water, Civilian Hummers cannot use the snorkel kit because the dash, fuses, alternator, power steering cap, transmission controller, radio, and engine controller are not waterproof. The Hummer H3 is a vehicle from General Motors' Hummer division introduced in 2006 and based on the GMT355 that underpins the Chevrolet Colorado and GMC Canyon compact pickup trucks. Currently produced at GM's Shreveport, Louisiana factory and the Port Elizabeth plant in South Africa the H3 is the smallest of the Hummer models, and the first to be built by GM. 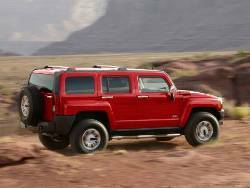 It is available either as a traditional midsize SUV or as a midsize pickup known as the H3T. 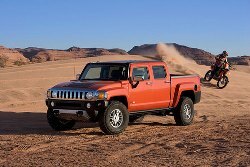 In 2007 GM South Africa launched their first Hummer production facility in Port Elizabeth, this move introduced the Hummer brand to the South African market and also somewhat lightened the load of the Shreveport factory in Louisiana. 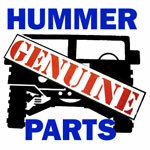 The plant manufactures only the Hummer H3, and builds for the South African market as well as the Asian market and European continent Particually In England. HUMVEE or HUMMER? The basic vehicle produced for military use is called a High Mobility Multipurpose Wheeled Vehicle (or HMMWV), which the military eventually called a HUMVEE for short. When AM General introduced a civilian version of the HMMWV, it was officially called a HUMMER. The Hummer is a tiger offroad. The H1 can climb a 22-inch vertical wall, navigate a 60% grade, traverse a 40% grade side slope fully loaded (with nearly 3,500 pounds of payload), and operate in up to 30 inches of water. The H2 can climb a 16-inch vertical wall, navigate a 60% grade, traverse a 40% side slope, and operate in up to 20 inches of water. The Hummer H3T is a mid-size pickup truck from the Hummer marque of American automaker General Motors. It is Hummer's first vehicle to be only sold as a pickup truck; the other is the larger Hummer H2, sold in SUV and SUT body styles. 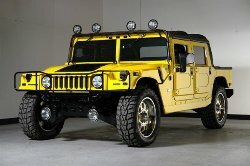 The H3T features a 5-foot bed with built-in storage boxes and is full-time four-wheel drive like other Hummer vehicles. The car was originally shown as a concept car during the 2004 Los Angeles Auto Show, and a production version appeared at the 2008 Chicago Auto Show. In 2010, the H3 has a minor interior facelift along with the complete redesign of their Colorado/Canyon siblings. The 281 hp 3.6 L LLT V6 found in the Chevrolet Traverse is expected to replace the current 3.7 Atlas I5 model with the promise of better fuel economy. The 5.3 Vortec V8 is still expected to stay in production. 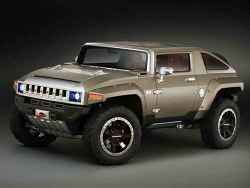 The Hummer HX is a concept Off-road vehicle/Compact SUV revealed on 8 January 2008 and manufactured by General Motors. The vehicle is smaller than both the H2 and H3 and is powered by a 3.6 L (~220 cu in) SIDI V6 that is E85 FlexFuel capable. A 2.4 L (~146 cu in) SIDI 4 cylinder option would likely be available as well, making it the very first Hummer with a four-cylinder engine. More compact than a HUMMER H3 – 81 inches (2,057 mm) wide, with a 103-inch wheelbase (2,616-mm) – the HX concept is an open-air, two-door off-road vehicle. Its design is based on the ideas developed by a trio of young designers who are new to the HUMMER studio.